"Suicide terror has become a fundamental strategic weapon in the confrontation between Fundamentalist Islam and its adversaries and now constitutes a threat to world welfare and security. The Shahids proposes that the nature of this terror changed after the attacks on the World Trade Center on September 11. 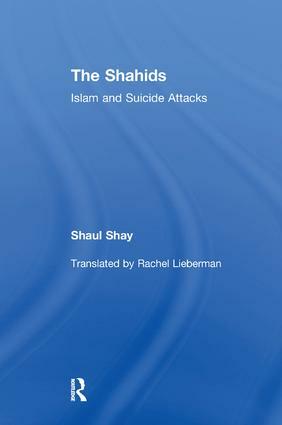 In this first book to be published on the subject, the author offers both an interpretation and an overall picture of a worldwide phenomenon that is not yet fully recognized, even in Israel, which remains a central arena for the perpetration of suicide attacks by terror organizations.The Shahids analyzes the general phenomenon of Islamic suicide attacks, and provides the reader with tools, comparative analyses, and comprehensive information enabling enlightened examination about suicide attacks worldwide. After a review of the historical development of the religious and ideological values legitimating suicide attacks, the volume explores the ways in which all terror organizations are both alike and different. It focuses on the countries that support terror--Iraq, Iran, and Saudi Arabia--discusses suicide attacks perpetrated by women and the suicide attackers' mothers, and shows how various countries have put an end to suicide attacks. It scrutinizes testimony drawn from confiscated documents regarding the approach of terror leaders and the administrative support of various organizations for suicide attacks, while offering descriptions and direction on ways to contend with this challenge. It explores the possibilities and recommendations for an international struggle against suicide attacks through the implementation of recently published, innovative ideas proposed by UN Organizations, Amnesty International, and Human Rights Watch.The Shahids maps out the overall phenomenon of suicide attacks, as well as identifies various organizations and central key figures through comparative cross-sections."